PembrokeshireÕs coastal national park is a beautiful, unspoilt playground with many secluded bays set in deep, cliff-lined coves. The regionÕs beauty lies in its geography, the three peninsulas offer a wealth of options with breaks facing all points on the compass, as long as thereÕs a big enough swell running then good offshore waves will be breaking somewhere. The main W facing beaches receive SW/W swell, are offshore with wind in the E quadrant and are a consistent bet. Whitesands is the name spot in North Pembrokeshire, popular with all kinds of surfcraft;, the beach has camping, good facilities and St Davids, the smallest city in the UK, a short drive away. 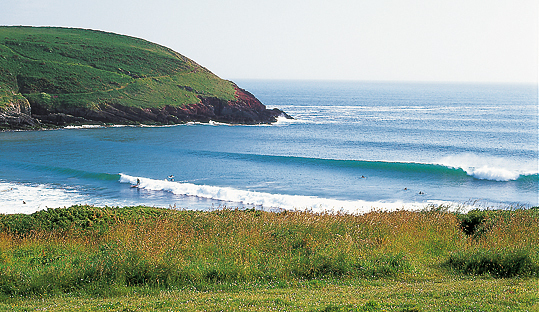 In South Pembrokeshire, Freshwater West is the main break, itÕs the site of frequent Welsh contests and yet the large beach remains refreshingly undeveloped. Pembrokeshire is a reliable year round destination, as the W facing beaches hoover up most swells and when the swell gets too big for the open beaches the sheltered coves come in to their own. Certain spots provide good shelter from strong, even storm force, winds.